We are getting the hang of this new uber relaxed schedule now and I don't feel entirely guilty when Amber starts school after lunch. Often the late school start is because she only had time for a shower before Noon. It's such a crazy schedule. Amber was concerned that she might be so terribly far behind that she'd have to school every day all summer. We discussed where she is in each of the important subjects and made goals for us to meet before Christmas break. I did acknowledge that summer might be more than one subject a day if we have too many sick days through the rest of the school year, but there is still plenty of buffer before that happens. We finally had the follow-up appointment with the GI doctor on Tuesday. This was long awaited and nearly didn't happen. In short, my car had a coolant issue at a very bad time and left us stranded at home. I have a Volvo for it's dependability, but I'm beginning to wonder if this is really working out in my favor lately. In the end, Fred was able to use his always dependable Volvo and get us to the GI doctor with 3 minutes to spare before they canceled Amber's appointment. Whew. (LEFT) Amber felt up to dressing in more than yoga pants and a t-shirt for bells practice. She actually wore this all day. (TOP-RIGHT) No more pictures... please. I almost believe it, except that she is giggling behind her hands. (BOTTOM-RIGHT) Watching a movie on her iPad after an exhausting day of doctor and shopping. The GI doctor is pleased that the Low FODMAP diet (with extra Fructose Malabsorption restrictions) is working out well for Amber so far. There were a few additional concerns about Amber's energy level and the rings around her eyes that were addressed during the appointment. All tests have come back normal, or normal enough, to allow the GI doctor to make a final (for now) diagnosis of only Fructose Malabsorption. The cause of FM is still unknown. Amber could have had inactive FM all her life and it was activated by some sort of bodily stress, even as simple as a cold. Or the virus she had last February could have damaged her gut and resulted in FM. Either way, it is believed to be a permanent condition that will need to be managed. We have decided to forgo the appointment at Children's hospital and keep the current GI. Amber desperately did not want to switch doctors and the current GI doctor informed us that she is beginning research into Fructose Malabsorption for a paper presentation. So, at least I know we are with someone who might have a clue about the condition. Six months ago I'd have been aghast at the FM required diet, but after all that Amber has been through and tested for, I'm ecstatic that we are only dealing with FM. We hope. The endocrinologist did call with test results just this morning and they are not entirely within normal ranges, but also do not indicate any specific problem. Amber has another follow-up with her endocrinologist in a month plus re-testing at that time. Her blood sugar has been doing crazy highs and lows too. It could be the new diet, hormones, or something else. We just can't ever get an absolutely final answer. Amber felt up to be crafty again this week. 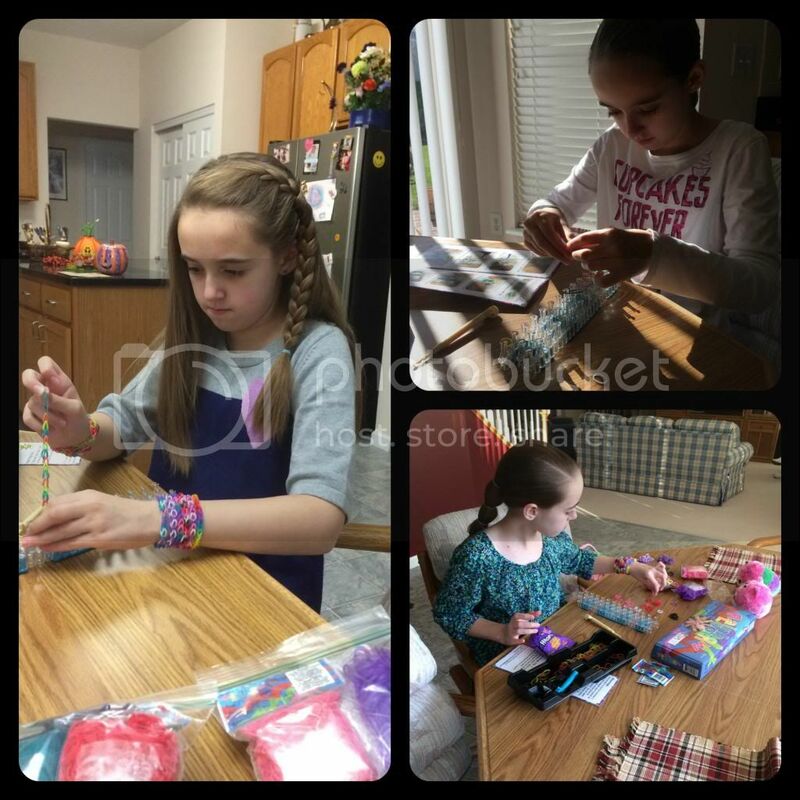 After purchasing the Rainbow Loom weeks ago, she finally started using it. Daily, I think. However, for now, we are happy to have our little Fructmal daughter feeling a little better and gaining energy. Amber still is about 8 pounds lighter than this time last year, but we are trying to fatten her up. We were also warned by the GI doctor that Fructmal children usually get 5-7 infections every winter. Great. Hopefully, we can minimize those because antibiotics do not help the healing of her GI tract. Amber's been very patient with the simple and repetitive diet, but is ALWAYS grateful when I find another safe recipe for her, especially when it is bread related. This week I managed to bake decent sandwich bread, finally. It's a sorghum bread that uses only 1 tablespoon of sugar for the whole loaf. So far, no reaction to two slices in one day. I also trialed sorghum muffins as a possible gluten-free / fructose-free Thanksgiving bread option. They were okay. I think I want to try again before Thanksgiving. However, the maple butter (with imitation maple flavoring) was a huge hit. Fred even liked the butter, but he said the muffins had a weird texture and lacked something. Of course they lacked something... sugar. They are dextrose only muffins. 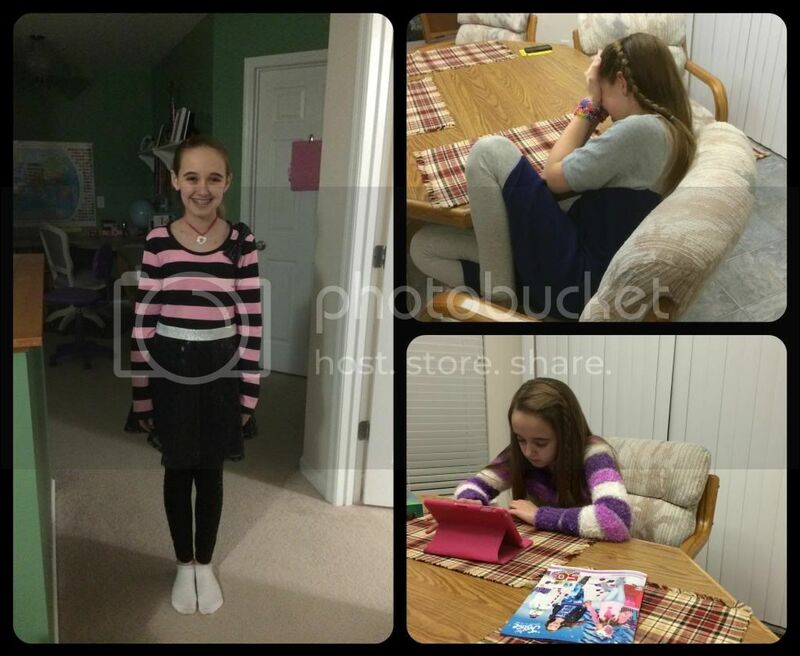 (LEFT) Somebody managed some Christmas / Birthday shopping this week while Grandma entertained Amber. (RIGHT) Edible sorghum sandwich bread. Finally!!! As for school this week, it was still less than ideal but we progressed. The GI doctor told me Amber will be tired for a while and will need to build up strength. So, I let the girl sleep as long as she needs and take breaks when she starts looking peaked. Not to mention the frequent snacks she needs. We are basically rotating the core subjects each week to keep each somewhat current. History was not very prevalent this week, but Amber did watch some Netflix during a rest period. She also watched a couple of Veggie Tales, just because she loves them still and they sorta went with our religion studies. Loosely, very loosely. It did remind us that her beloved Little Joe is actually on VHS tape and our VCR is no longer in use (it's in the basement collecting dust). I guess I will be looking for a Little Joe DVD as part of her Christmas / Birthday gifts. Amber completed quite a bit of grammar and logic this week. We are on target to finish logic prior to Christmas break and then if Amber is up to it we will start more formal logic in January. Grammar, at long last, introduced new material. Hallelujah. The review material was still good practice because Amber now has a great handle on direct objects, which last year she struggled with often. There wasn't a lot of writing this week except for note taking in biology (it's almost finished.. just one more week!) and the single history lesson. Amber has had quite a few headaches this week and a lot of trouble concentrating, so I let her off the hook for narrations. She did manage 3 math lessons, which is an improvement over last week. She's still on course to finish pre-algebra at the end of 6th grade, but she knows that we can slow down if she needs it. (LEFT) We still love our dry erase wall! It was one of Amber's thankful items this week. (TOP-RIGHT) Religion - Joseph being sold into slavery. (BOTTOM-RIGHT) Working hard on indirect objects in grammar. There were quite a few religion lessons this week, along with crafts, and all of Amber's regular activities. Amber even picked back up the piano lessons that we let slide for several months. Er-hm. Amber simply didn't have the energy everything. She's working on Christmas music in both flute and piano now making it very festive around here. Amber has asked instead of skipping science in December that I put together a little unit on Fructose Malabsorption for her. She hasn't done the research like me, or have the life experiences to understand the implications of information she does know. I thought maybe some hospital or doctor's office would have published a little pamphlet for their pediatric Fructmal patients... but not so. I guess I'm pulling stuff together for Amber. But honestly, she needs years more of chemistry to understand a lot of the information. Amber doesn't like being unable to explain what Fructmal is to people who ask. She is dependent on me and that bothers her. Stay tuned to see if I figure out a way to simplify the information. It sounds like you are handling the challenges in your lives well. Flexibility helps so much, doesn't it? My son is best on a low sugar and gluten diet (he has sensory processing disorder). I really empathise with the struggle to keep food interesting. Lucinda, Amber has sensory processing disorder too. She's gone through therapy and we work with it every day. I've been wondering if it somehow was an early warning of what was to come. A dry erase WALL?? Oh, I need a few of those! What a fab idea! Love Amber's bracelet's! She's a strong young lady, huh? She will get through all this stuff (as will Mom and Dad). I'm glad to see that Amber is feeling a bit better and that you've got some sort of a diagnosis. I have never heard of Fructose malabsorption before. And we thought we were the only ones around with weird and unusual illnesses! 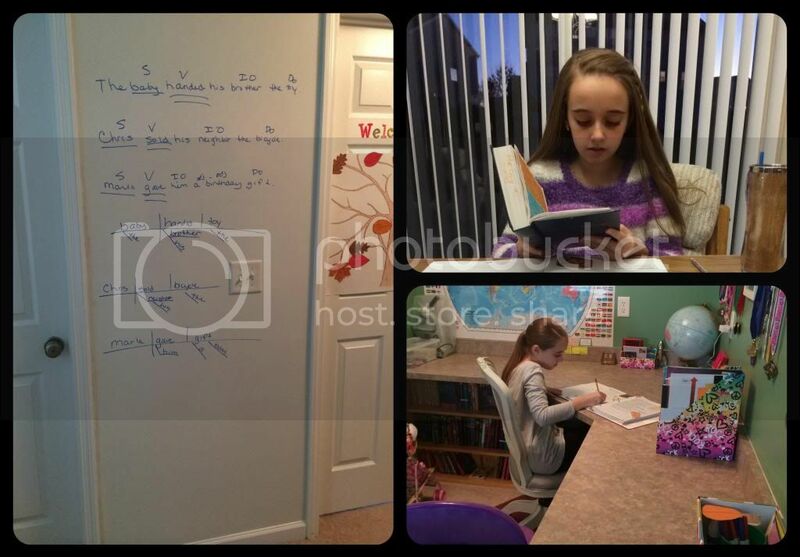 Thank God you homeschool so she can rest and work on her own schedule! May God Bless you guys with a healthy infectionless winter! LOVE the dry erase wall. It sounds like you all are holding up well. I am so glad that Amber is feeling a little bit better. I hope everything keeps improving.